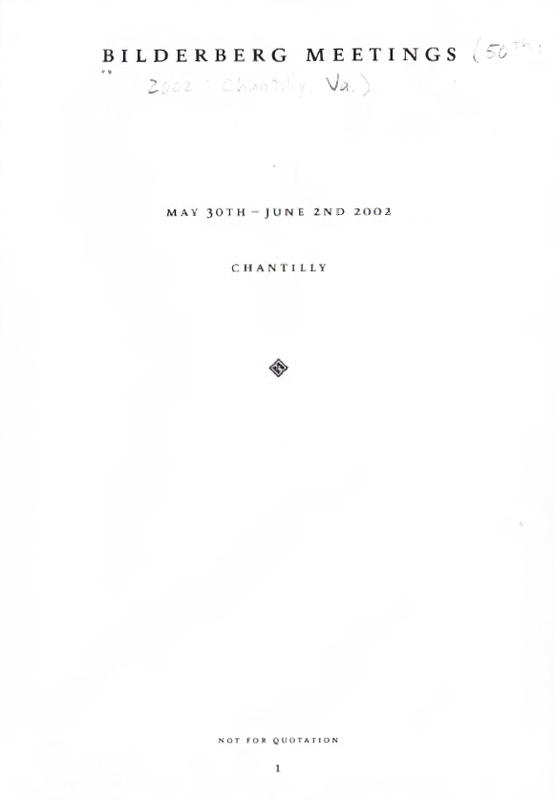 The fiftieth Bilderberg Meeting was held at the Westfields Marriott, Chantilly, Virginia,from May 30h-June 2nd 2002. There were 115 participants from 20 countries. The participants represented government, diplomacy, politics, business, law, education, journalism and institutes specialising in national and international studies. All participants spoke in a personal capacity, not as representatives of their national governments or employers. As is usual at Bilderberg Meetings, in order to permit frank and open discussion, no public reporting of the conference took place. This booklet is an account of the 2002 Bilderberg Meeting and is distributed only to participants of this and past conferences and to prospective participants of future conferences. It represents a summary of the panelists’ opening remarks for each session, and of the comments and interventions in the subsequent discussion.